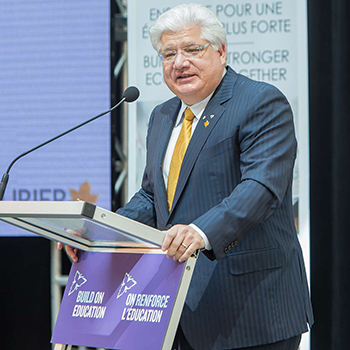 Technology entrepreneur and philanthropist Mike Lazaridis says Wilfrid Laurier University's new Lazaridis Hall will help recruit and retain the best and brightest students, researchers and entrepreneurs from across Canada and around the world. "This spectacular building and facility is so important," Lazaridis said during a celebration marking the grand opening of the building on Wednesday, May 24. "Its impressive scale, state-of-the-art classrooms, high-tech facilities and well-thought-out functionality shows our enormous commitment to their education and their careers. "It's an important symbol that shows how serious we are about recruiting and training them here. It helps us compete on a global scale." Hundreds gathered in Lazaridis Hall's bright and spacious atrium to celebrate the official opening of the newest landmark building on Laurier's Waterloo campus, with members of the university community, donors, friends of Laurier and government dignitaries in attendance. "Projects like this building are based on strong partnerships," said Laurier President and Vice-Chancellor Max Blouw. "In this case, among governments, faculty, staff, architects, engineers, builders and many great supporters… Laurier has a very bright future ahead and this building is emblematic of that future." Located on University Avenue, the 220,000-square-foot Lazaridis Hall is utilized by more than 6,000 students and more than 190 full-time and part-time faculty members. The four-storey building is home to the Lazaridis School of Business and Economics and Laurier's Department of Mathematics, as well as the Lazaridis Institute for the Management of Technology Enterprises and Schlegel Centre for Entrepreneurship and Social Innovation. The Lazaridis Institute was created to support growth-oriented Canadian technology companies, while the Schlegel Centre builds and supports entrepreneurship and social innovation in the Laurier community. Lazaridis, the building's namesake, donated $20 million to create the Lazaridis Institute and to help support the construction of the new building. The Ontario government contributed $72.6 million for the building and $15 million toward the Lazaridis Institute. The federal government contributed $9.93 million in infrastructure funding. "This is magnificent evidence that investing in infrastructure can produce remarkable results," said Ontario Minister of Advanced Education and Skills Development Deb Matthews. "When you hear people talk about infrastructure, think of this building… It's creating countless jobs and significant new opportunities for students." Bardish Chagger, Waterloo MP and Minister for Small Business and Tourism, said Lazaridis Hall and the faculties it houses are a key part of Canada's future prosperity. "Innovation and entrepreneurship are vital to Canada's success in our global economy and there is a clear role to play for government in supporting and driving this change," Chagger said. For Lazaridis, establishing the institute was part of his vision to ensure Canada is prepared for the next "industrial supercycle," an era he believes will be defined by quantum-based technology. Lazaridis' determination to create a "Quantum Valley" in Waterloo Region is based on the area's established high-tech sector and outstanding educational institutions, including Laurier's business school. "Our vision for the Quantum Valley involves intercepting the second quantum revolution and preparing for the next wave of industrial growth in quantum computing, quantum-enhanced technologies, materials and sensors," Lazaridis said. "Today's opening of Lazaridis Hall is important to the Quantum Valley ecosystem and I fully expect that some of the future grads from this business school will be leading and managing the companies that will be born here." Designed by Diamond Schmitt Architects, Lazaridis Hall is a functional, bright and open environment featuring state-of-the-art meeting, teaching and collaboration spaces, including a 1,000-seat auditorium. The building's exterior showcases a number of eye-catching architectural features, including the drum-shaped design of a 300-seat lecture hall on the second floor. "I'm delighted with the way this place reflects our increasing knowledge about how students learn," Matthews said. "It's mostly about learning differently, about creating an environment where people can really explore and use their brains in brand new ways." Lazaridis Hall was designed for LEED Gold certification and includes environmentally sustainable features. Forestry Stewardship Certified building products were used where possible and an underground cistern captures rainwater off the roof for use as greywater throughout the building. High-efficiency lighting and an effective use of natural light serves to lower energy use. Lazaridis Hall also includes an innovative five-pillared donor recognition wall. The wall's touch-screen tiles, designed and manufactured by Christie, a Kitchener-based global audio and visual technology leader, include information about donors to Laurier’s Building Canada’s Best Business School campaign in support of the Lazaridis School. The tiles – part of a $1-million donation from Christie to the university – feature donor profiles, a timeline of the Lazaridis School and a list of the more than 2,500 donors who supported the campaign. Peter Ansley, chair of the fundraising campaign cabinet, paid tribute to those donors as part of the Lazaridis Hall grand opening event. "This building is a game-changer for Wilfrid Laurier University," Ansley said. "As you can see when you look around this beautiful building, this is what can happen when people act on a spark of inspiration."